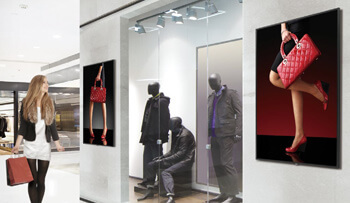 LG’s range of commercial digital signage displays with built in WebOS System on Chip (SoC) give users a simple, all in one digital signage display option. 24/7 devices ranging from the standard LFD to the unique and wonderful world of LG including stretched displays, outdoor and high bright display options. 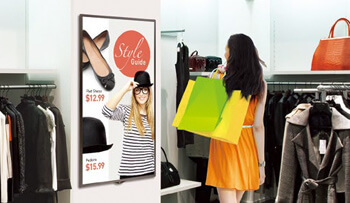 Using embed signage with LG’s range of WebOS devices offers users an easy and effective digital signage option. Simply connect the WebOS device to the internet via wifi or ethernet, follow our simple steps to easily configure them to run the embed signage WebOS application and within minutes you can publish content directly to the display. LG offer a range of commercial grade display devices from the standard HD LFD monitor ranges (22″ to 65″) to their 86″ and 88″ stretched monitors. 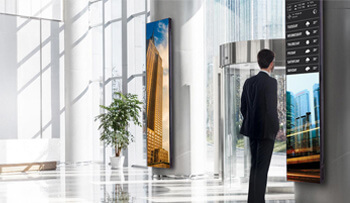 LG also offer both high bright and outdoor options, as well as 4K* display technology loaded with WebOS that embed signage users can take advantage of. *WebOS SoC player outputs at 1920×1080. For 4K (3840×2160 res) on the 4K LG WebOS display range, please use an external 4K media player. Once an LG WebOS display is registered to embed signage, various screen control can be carried out directly via the software. Controls include the ability to set on / off timer schedules, rebooting the device, grabbing a screenshot of what is currently playing, adjusting volume, changing storage options (USB, SD* or internal), changing the display orientation and turning off the display. *SD card only available on certain model displays. Using LG WebOS displays with embed signage, users benefit from the excellent digital signage features including conditional play of content based on days, dates, times, weather temperatures and tags for dynamic playlist creation and device specific content. To see all the benefits of running LG WebOS displays with embed signage head over to our features section. Getting started with embed signage and LG WebOS is very simple indeed. First sign up for an embed signage account and then configure your LG WebOS display to run the player application. Once done, register the device to the account and start publishing content to the screen.